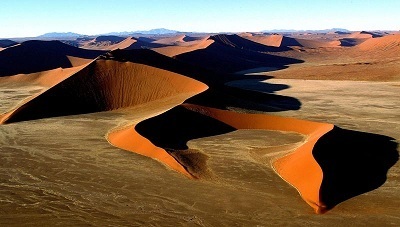 Namibia is unique; there is no other place that will capture your soul like Namibia can. Once you have visited this desert paradise you will always yearn to return oneday. This program combines some of the very best Namibia has to offer the first time visitor as you get to experienc, the spectacular Sossusvlei, Damaraland and Etosha all in one trip. ***A great add on for someone with a bigger budget the Skeleton Coast is a must! International & domestic flights, visas, items of a personal nature, excludes all drinks and laundry. 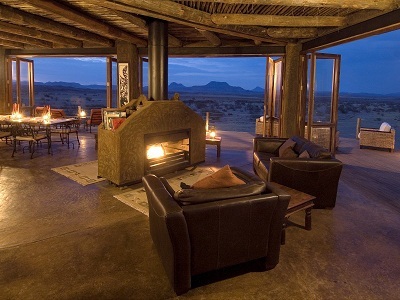 Upon arrival in Windhoek you will be transferred via light aircraft to Kulala Desert Lodge for two nights. This is a perfect location to see desert scenery. The desert-adapted animals such as ostrich, springbok, gemsbok, and predators can be viewed here. Activities include early morning guided drives to the Sossusvlei dunes, nature drives and walks or an excursion to Sesriem Canyon. Other options, at extra cost, are horse riding and hot air ballooning trips. You will be transferred by light aircraft to Doro Nawas Camp for two nights. 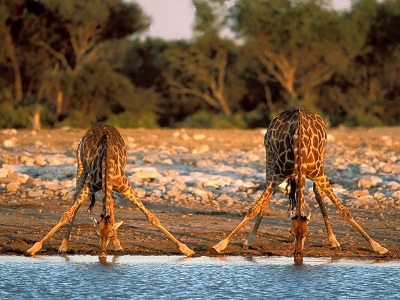 Doro Nawas Camp is situated in the Aba-Huab RiverValley within the 407 300ha Doro !Nawas Conservancy. A varied and surprising assortment of desert-adapted species such as the unique desert-adapted elephant, gemsbok, kudu, springbok, steenbok and the rare desert-adapted black rhino can be seen as well as excellent birding. Carnivores include brown hyena, bat-eared fox and black-backed jackal. Activities include guided game drives and walks exploring the Huab and Aba Huab river systems, viewing Africa’s largest collection of prehistoric rock engravings and Bushman rock art at Twyfelfontein and other geological wonders like the Petrified Forest, Burnt Mountain and Organ Pipes. Andersson’s Camp is locatedon the private 30 000-hectare Ongava Game Reserve, south of Etosha National Park’s The camp has 20 tented guest units of stone, canvas and wood all overlooking a waterhole. Between Etosha and Ongava, there is plenty of wildlife to see, such as springbok, gemsbok, wildebeest, Hartmann’s mountain zebra, elephant, red hartebeest,giraffe, eland, and Burchell’s zebra. Predators include lion, leopard, and cheetah; unusual species include Damara dik-dik and the endemic black-faced impala. Ongava has both black and white rhino and prolific bird life with over 340 species. You will be transferred via light aircraft back to Windhoek for your onward journey.